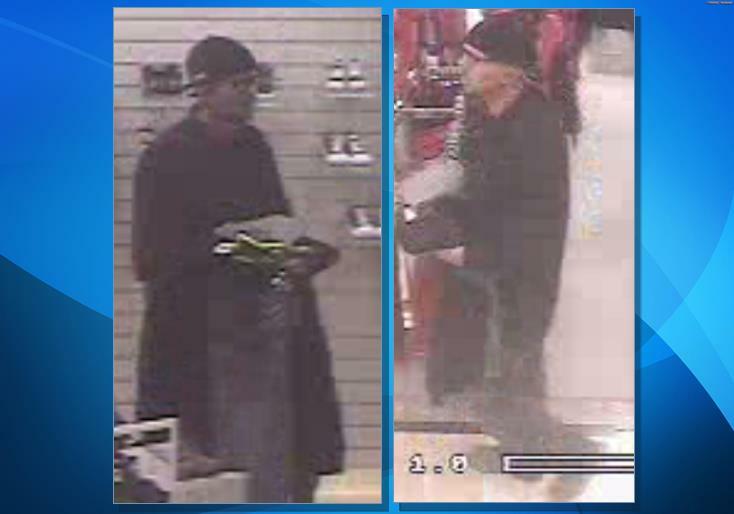 PALMDALE – If you recognize the man in these surveillance images, then Palmdale detectives would like to hear from you. The man is wanted for using a stolen credit card at Dillard’s in the Antelope Valley Mall immediately after a vehicle break-in at the nearby Palmdale 24 Hour Fitness gym. On Monday, November 18th, the victim parked her vehicle in the 24 Hour Fitness gym parking lot. While the victim was in the gym her vehicle was broken into and her wallet was stolen. Approximately 45 minutes into her workout she received a bank notification on her cell phone alerting her of two transaction attempts at Dillard’s. The victim immediately reported both incidents to Palmdale station. When deputies arrived at Dillard’s, loss prevention was able to provide a description of the suspect as well as video surveillance. The suspect is described as a male Hispanic approximately 25-30 years-old. He is wearing dark rimmed glasses and all black clothing. Anyone with information on the identity or location of this suspect is encouraged to contact Detective Moser of the Palmdale station at 661-272-2470. 16 comments for "Help deputies ID theft suspect"
Well it would help if someone would clean up the picture, one pic looks like he is black, the other white, it makes a huge difference with identification. in away good he used it…that’s how we now know who is this criminal..and we will report him as soon we see him. people don’t believe about “WORK” anymore…it’s just as easy to get stolen credit cards as getting cash aid from the government! if I see him I will video tape him and share it in every social media. SHAME ON YOU!…WAIT FOR IT…IT’S COMING BACK TO YOU! as far as the employee I feel so sad for that person…i am sure it’s gonna cost them their job, and then more robberies will be happening! So… Cashiers aren’t checking ID for credit card purchases? Stolen credit card used? So that only tells me that the employees at Dillard’s didn’t check for ID!! OHHH well! I hope this picture gets blown up and put at every checkout stand and entrance to the Mall and restaurants. He needs to be caught. He has probably sold her id by now, but he still stole it even if he doesn’t have it when he gets caught. He may not be “from” here, but he obviously “works” and shops here! get what he deserves in prison, and again at Judgement dDay. Victim is a hero and a very hard working individual. She especially, didn’t deserve that! Cops really want us to help but dont offer no rewards! Times are tough, you want me to get involved, offer a reward. Ha ha, C.D.,you could try being a responsible member of the community, just “do the right thing “,ya know? help your community…because of mind like yours…people think they need to get rewarded for something it’s their duty to do. THINK “SAFETY FIRST”… I beat you are one of those people to complain about how bad AV is..but jet want to get a “REWARD” to do what you are supposed to do as being a part of this community…with all respect to you C.D the safety starts with you! here that he definitely should do it because it’s the right thing to do but this is someone very close to me who this happened to do I will play this game with CD. Whatever it takes for me to get him. For everyone else, I thank you for being reasonable people here in our community. just so you know, the Dillard’s employee did NOT get in trouble because Dillard’s does not require their employees to ask for id’s believe it or not. He had to open her military wallet which had her picture in full uniform to get to her card. Her dogtags were in their as well. First prize for the most sarcastic comment.